The “7” series has been designed and tailored to real customers’ needs to let them meet the requirements of an increasingly competitive agriculture. By combining low running costs with maximum comfort, reliability and excellent performance the “7” series decidedly meets the requirements of large-sized farms and contractors. The range consists of 6 models equipped with the latest F.P.T. - Nef (Tier 3) 6 cylinder turbo engine. The engine family features 24 valves and a Common-rail electronic injection system providing excellent torque features for great flexibility of use. In addition to this the Dual Power system allows the power available at the PTO to be automatically increased. A powerful engine combined withan excellent mechanical, hydraulic and electronic performance make the “7” series tractors ideal for the most demanding applications, from soil cultivation to traction and PTO work through to roading and transport operations. 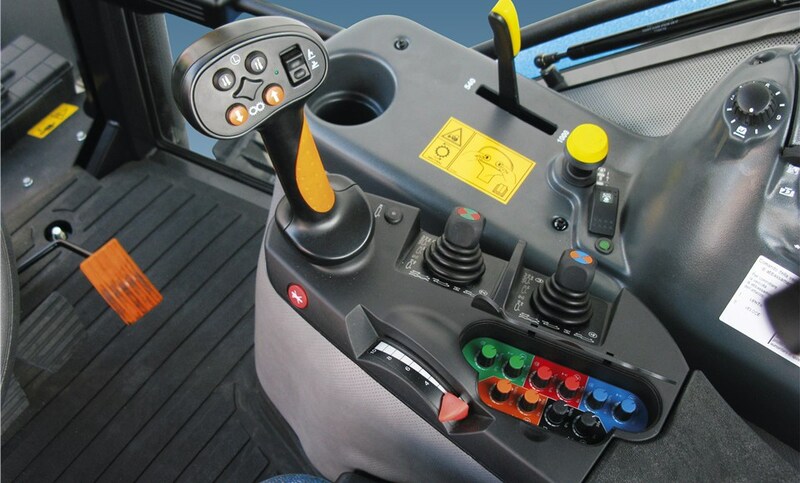 The innovative electronic “Autopowershift” is available with a choice of mechanical (Techno) or electronic range shifting (Comfort o Full-Tronic). The “Autopowershift” transmission provides 32 speeds and four synchromesh ranges with hydraulic reverse power shuttle. The rugged cast steel chassis and suspended engine fitted on the new “7” series provide less vibrations and a lower noise level, thus ensuring the utmost driving comfort. The “7” series tractors can be optionally equipped with independent wheel front suspension providing a higher degree of stability and an excellent road-holding. A front hitch and PTO are also available as an option making this range truly versatile for applications using front-mounted implements or rear and front implement combinations. The Master Class cab, conceived to meet the requirements of the most demanding customers, offers and unequalled allround visibility thus providing the utmost in comfort and safety. With the “7” series there is no way of getting tired even when working on long work shifts or all day long. The new F.P.T. - Nef (TIER 3), 6-cylinder turbocharged engines fitted on the 4 models making up the new “7” series feature 24 valves and a cylinder displacement of 6728 cm3. All engines are equipped with a high-pressure electronic COMMON-RAIL fuel injection system delivering 162 to 225 HP and ensuring ultimate performance in any work condition. 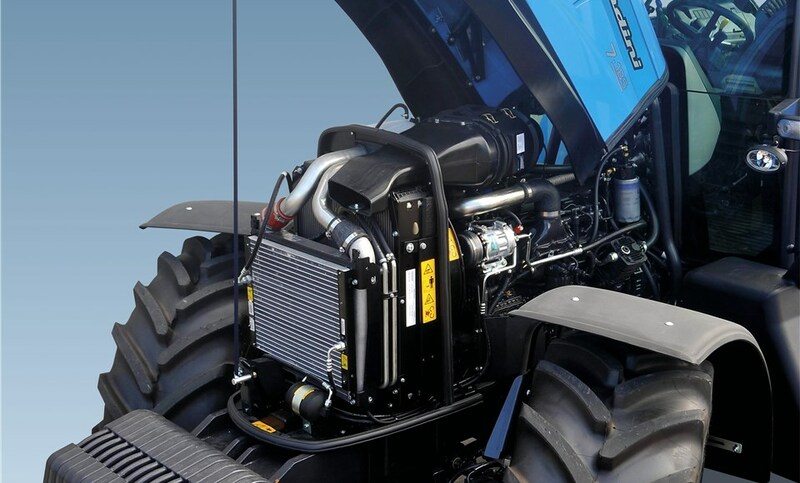 Purposely designed for farming applications, these engines of modern design offer a number of cutting-edge technical solutions. The advanced electronic control systems ensure an optimum and environment-friendly combustion and compliance with the Tier 3 emission standards, whilst maintaining excellent fuel economy. Noise and vibrations are reduced to a minimum thanks to the cast steel chassis ensuring longer engine durability. In addition to this, the Dual Power system, combined with the engine electronics, allows an automatic increase of both the power and torque available at the PTO. The fully-tilting hood pr ovides easy access to the engine for routine service and maintenance. AUTOPOWERSHIFT TRANSMISSION, COMFORT, SPEED’, PRODUTTIVITY, ECONOMY. The “AUTOPOWERSHIFT” transmission provides 32 speeds (4 ranges and 8 powershifts under load per range) wit h hydraulic reverse power shutt le and is wit h the mechanical (techno) or electronically controlled (Comfort and Full-Tronic) range shifting. The electronic “Full-Tronic” gearbox is controlled via a joystick integrated into a multi-function “Electronic Ar mrest” which allows all ranges and electr onic powershift speeds to be engaged by simply pushing a button. The electronic system also features a “Range Sequencer” system allowing “smart ” shifting through all four ranges and a device named “Autoshift” for automatic gear shifting during transport operations. The Autoshift selects the right gear according to the engine load and rpm allowing simple and smooth driving for maximised comfort and productivity and minimised consumption. The transmission is also equipped with a hydraulic “Reverse Power Shuttle” which provides a total of 32 forward and 24 reverse speeds. A creeper unit can also be fitted as an option to achieve 48 forward and 40 reverse speeds. FRONT AXLE WITH HYDRAULIC INDEPENDENT SUSPENSIONS. 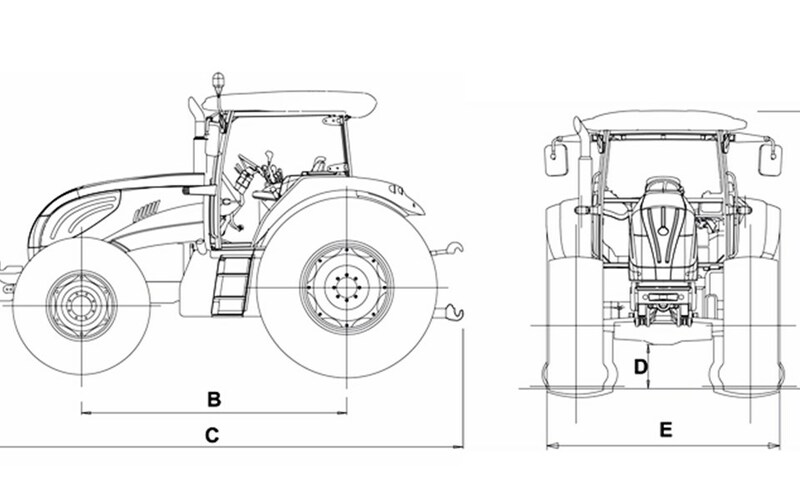 Tractors can be optionally equipped with a front axle with independent, electronically-controlled hydraulic suspensions ensuring high speeds on rough grounds and improving traction and manoeuvrability for enhanced comfort , safety and productivity. The "Master class" four-post cab with lange, rearhinged doors offers unequalled all-round visibility and allows the operator to enter and exit with ease and safely. It is equipped with air conditioning system located in the roof area, an adjustable steering wheel and a pneumatic seat with multi-function "electronic armrest in the full-tronic version. The accurate automotive-style interiors and excellent sound-proofing make driving a pleasure. 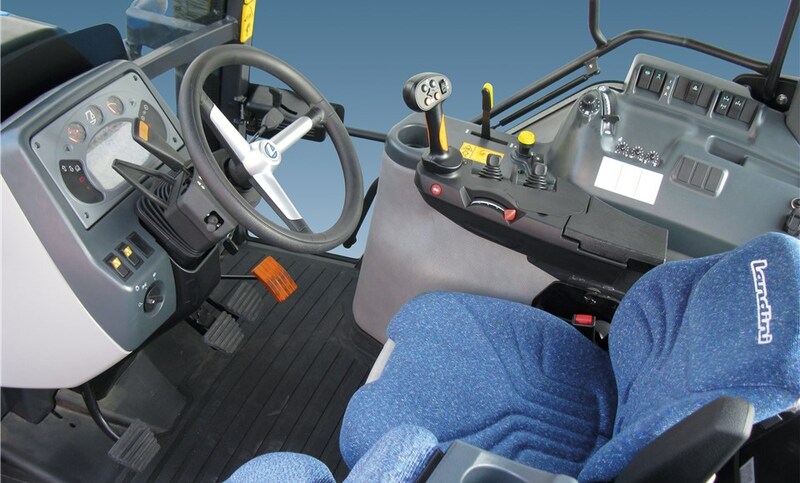 Optionally the cab can be equipped with electronically-controlled hydraulic suspension L.S.H.C. 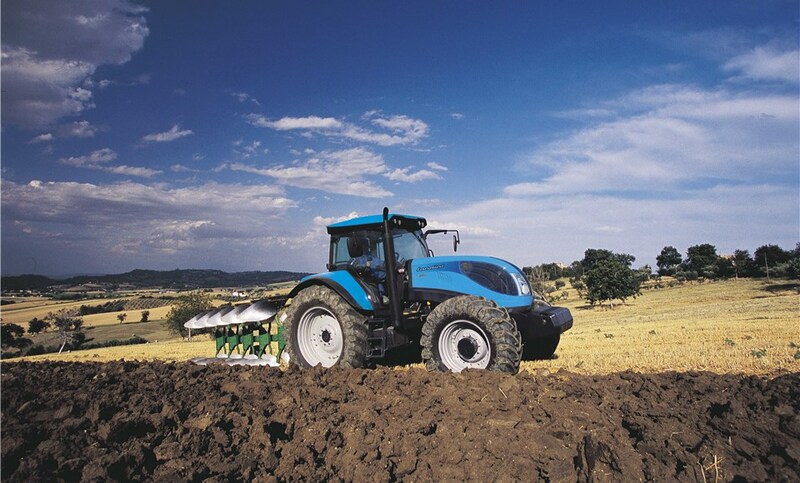 (Landini suspended hydro cab), which, combined with the indipendent front suspended axle, (optional) provides maximum driving comfort. CLOSED-CENTRE HYDRAULICS AND VERSATILE AUXILIARY VALVES. The closed-centre hydraulic system with variable displacement pump provides a flow rate of 130 l/min (a pump with a higher flow rate of 163 l/min is available as an option) and ensures optimum operation of the five rear hydraulic valves available (in the full-tronic version all valves are electro-hydraulically controlled). 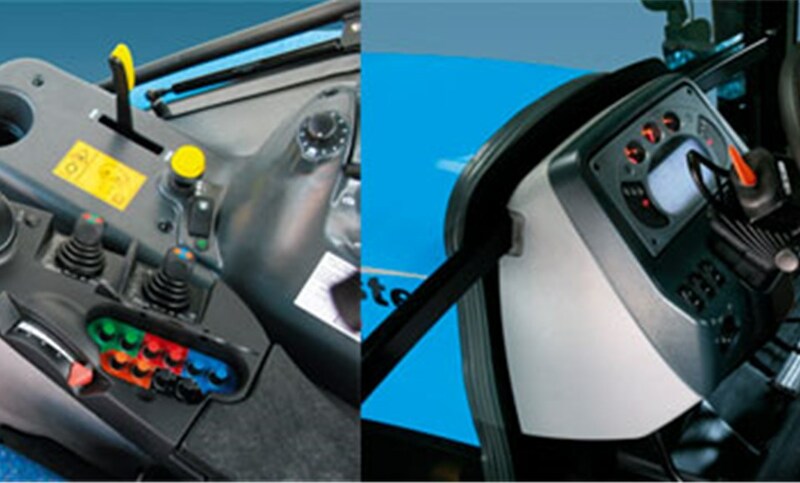 One of which is controlled via the pushbuttons integrated into the joystick whilst the other four are operated by the buttons integrated into the multi-function armrest where timers and flow regulators are also positioned for easy and comfortable adjustments according to the job to be carries out.